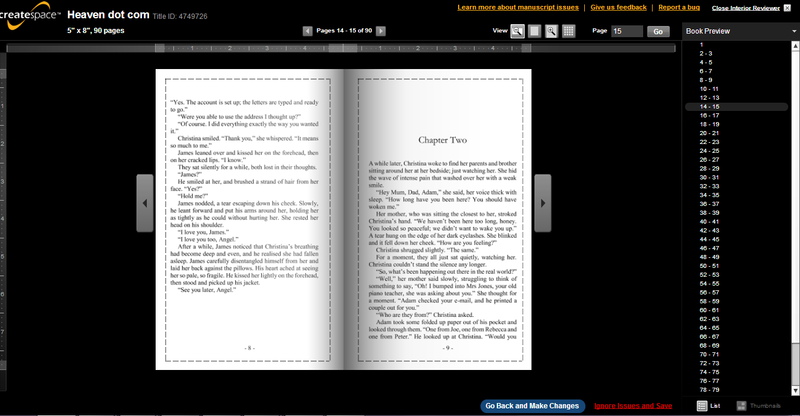 Welcome to part 5 of the Self-publishing on Createspace Series. You can catch up by viewing Part 1, Part 2, Part 3 and Part 4. I will dive straight into the next step which is uploading the cover. 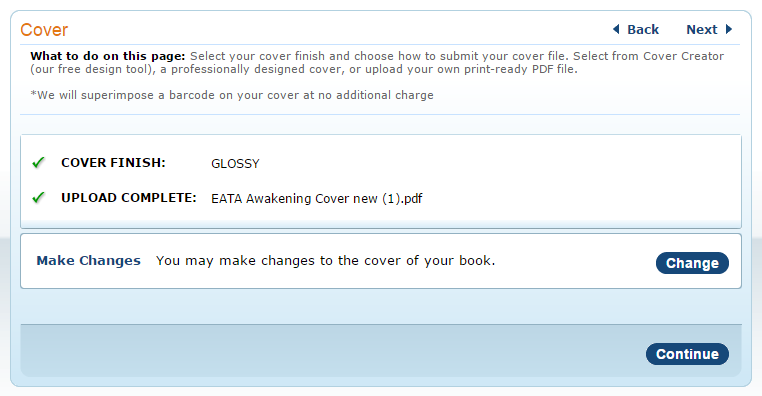 At this stage, you will either have a PDF of your full cover (ie. the front cover, spine and back cover all in one) or you will have JPGs of the front and back cover separately. 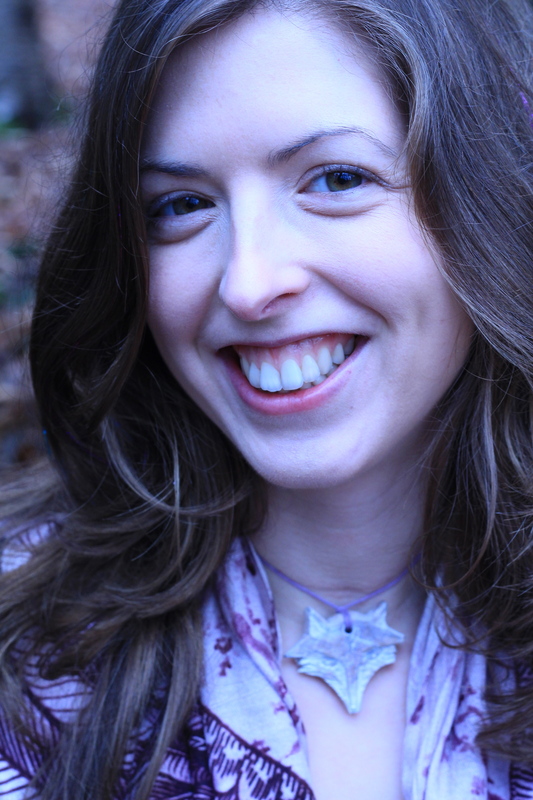 There is a cover designer in Createspace, but as it is very basic, I would recommend that you get your cover designed and made into a full PDF as it will look more professional. When I first started out, I used to use the creator to do the spine and upload the front and back images, which is okay, but you won’t be able to add the publishing logo to your spine, and as I discussed in an earlier post, that’s actually quite an important part of your cover. To help your designer to work out the sizing for the PDF, you will need to know the final page count, and then using the info in this page, work out the spine width. 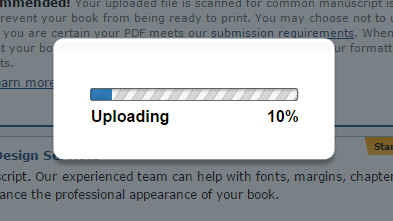 I will go through the process of uploading the PDF first. 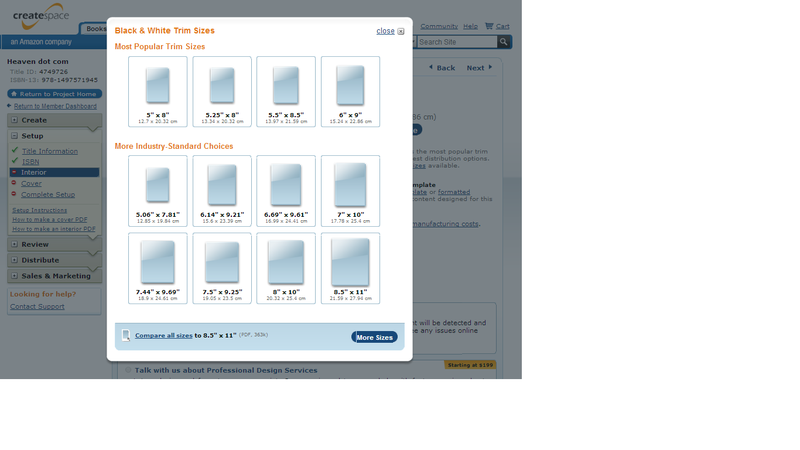 Click on Cover in the menu. 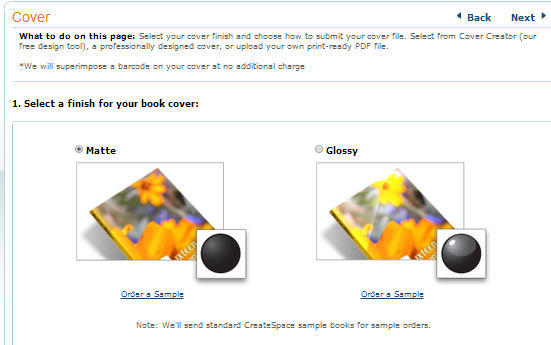 The first choice you need to make is – Matte cover or Glossy cover. Both are good choices, I have published my Earth Angel series with glossy covers, and my Visionary Collection with matte. Go into a bookshop and look at books in the same genre as yours. I found that many fantasy and sci-fi books actually had glossy covers, while romance books tended to have matte covers. I believe that the choice of cover is a personal one, though I must admit, more than anything, I just love the way the matte covers feel! Then hit save, and it will upload. 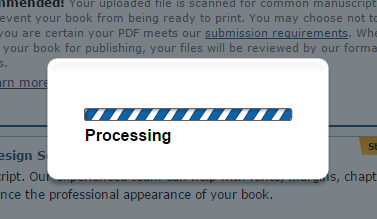 Once it is uploaded, you can click on continue, to move onto the next step, which will be covered tomorrow. 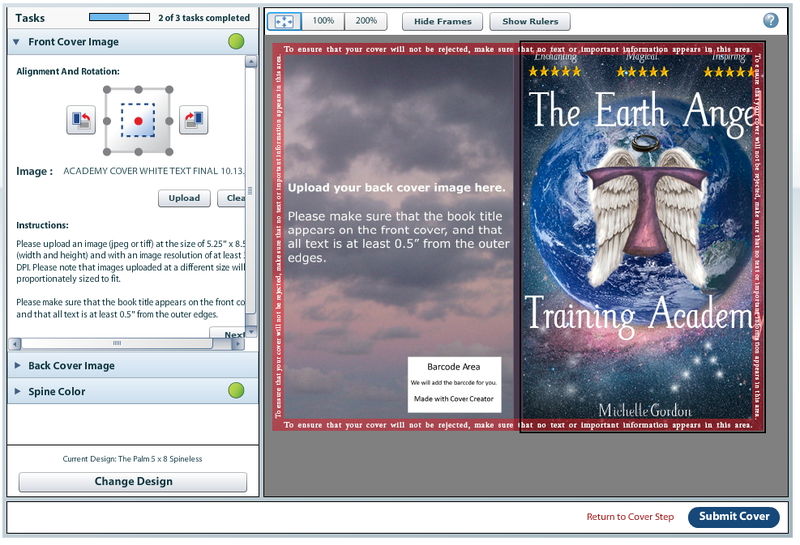 If you have separate JPG images for the front and back cover that you wish to upload, you will need to use the cover creator, which is option 1. 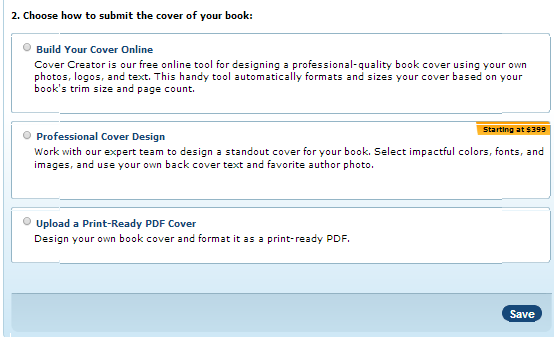 Click on Launch Cover Creator. 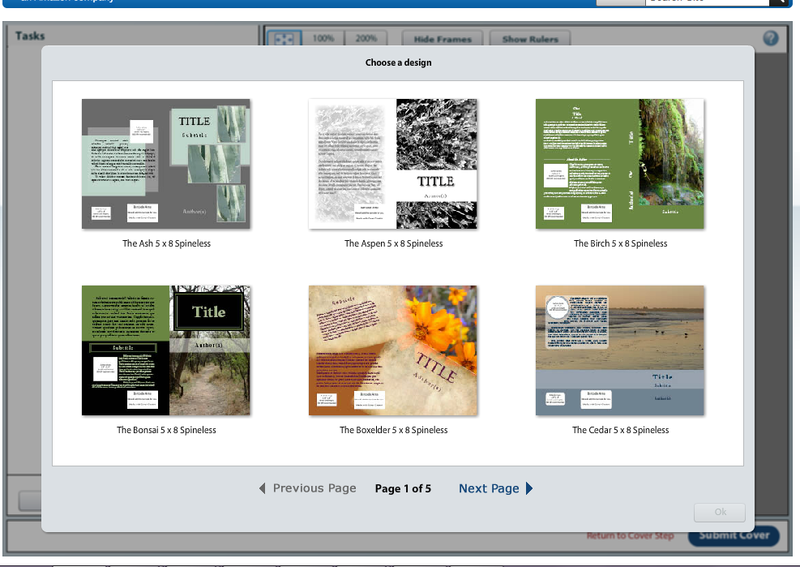 You’ll need to scroll through the templates to page 5, and choose the The Palm and click OK.
Then you will go through each step, uploading the front and back covers, and choosing the spine colour. The spine text will be entered from the info you have already entered, but you can tweak it if you want to. If your book is any colour other than black or white, then you may find it difficult to match the spine colour as there is a very limited selection of covers to choose from. 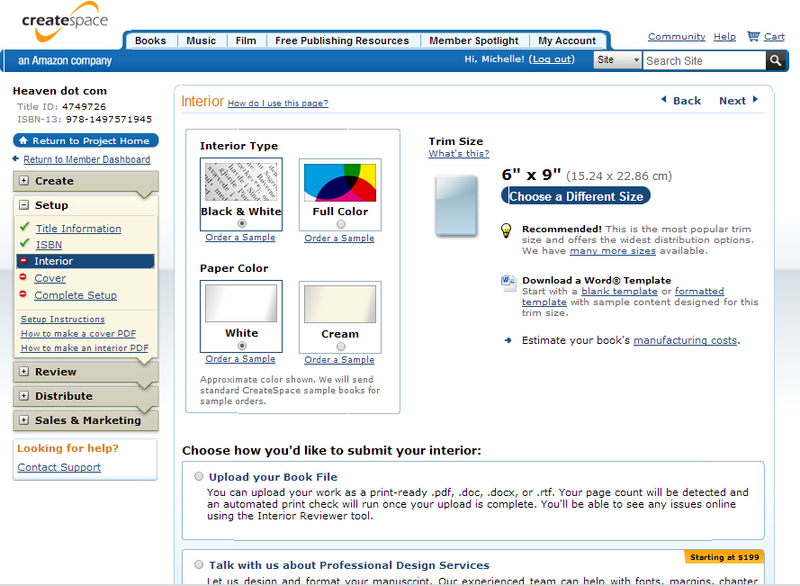 Your images will need to be at least 300DPI and the right size for the book trim size you have chosen. In the example above, this cover would be deemed unacceptable, because there is text in the red area around the edge. 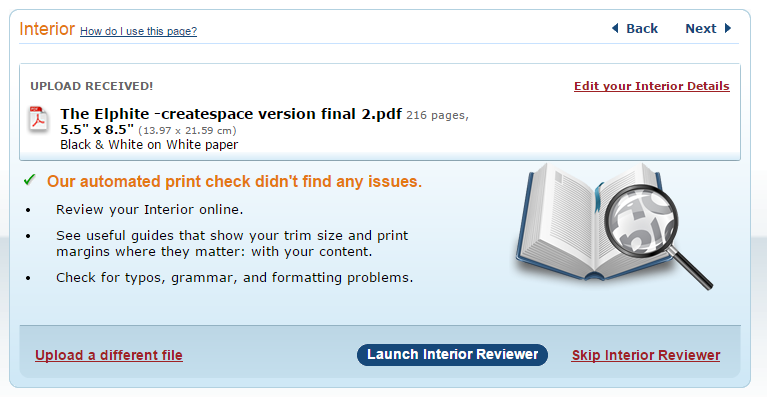 Createspace will not allow any vital info to be in these red areas in case it is cut off in the printing and trimming process, so you will have to ensure the title and other text is within the middle area. 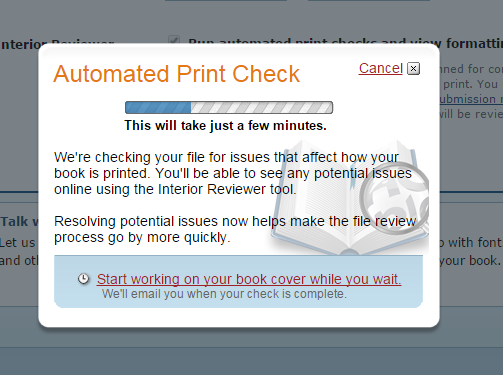 Once you have completed the steps, you can click Submit Cover, and then you can review the PDF they create of the cover to check that it looks right. Then you can click Save and Continue. Congratulations! I will cover the next steps of the process soon.